I've been getting a few questions about different aspects of the container tutorials series I posted a while back - while the series is not finished, neither is it forgotten, I've collated information regarding the series into a topic on my wiki and I'll keep this up to date until I've finished the series off. It's been a long time since I've really felt "pleased" by the results of overclocking... probably back in the days of the 300A if truth be told, which is in the long long ago ;o) ... and for the last year I've been mostly using a laptop, and having really kept track of desktop tech. ... So I have to admit to being very pleasantly surprised when I built myself a Core Duo machine (to be used while my Laptop is getting a labotomy) with a bottom of the barrel 4300 processor and then proceeded to overclock it from 1800mhz to 3042mhz ... that's a serious leap in performance :) very pleasing... and I still haven't hit the ceiling which is even more pleasing, I just had to stop fiddling and get on with doing some actual work. just been a little busy these last few days. Now let's write the start of our decorator. 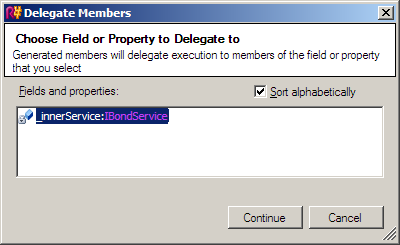 key bindings) and select "Delegating Members". At that point select the only option, the inner service. And then select all the members to delegate for. So I quite like Family.Show as an end to end solution of WPF goes... but I think what's been more fascinating is seeing how my (beautiful) Financee is finding it as a working product. So she's a big genealogy zealot - and for the first time when saying "hey have a look at this" for some random piece of tech I could see here interest was piqued, so we click-once'd it onto her machine and she's been playing around with it for the last day or so - having loaded around 300 people into it so far. First off the good - it's pretty, and very fluent - you can see immediately who's being edited, current vs. past relationships, dead vs. alive (hollow people are dead... ) And it performs nicely... 200+ vector "people" on screen and the machines not sweating a bit. Surprisingly it's also pretty quick for data entry, something I had my doubts about when first looking at the application vs. something a little more traditional - after about 5 minutes of experimentation she was an expert. Second the bugs... well the main one is that certain characters in a name like a double quote causes the "stories" data screen to crash upon saving... And every now and then it just flakes out completely... I might throw some logging into and see just what's going on, it doesn't even let you get a stack trace *erk*. A big problem during times of war because it was not uncommon for widows to marry the brother of their dead husband. This seems like a big oversight (though it is just a tech demo). Interesting though, and this sample is definitely the best WPF app with source code I've had to play/learn from... great stuff Vertigo. technology releases so far (but it is very early days). doing evil live, and where community input will be vital I think. 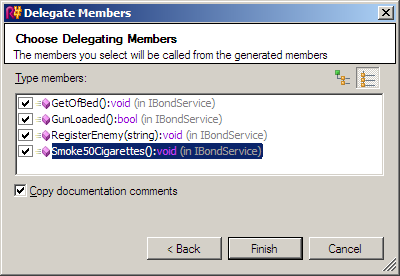 that using the same application on multiple machines (i.e.